Everybody, let's rock! 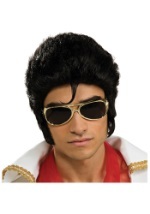 Celebrate the most popular rock'n'roll performer of all time with one of our Elvis costumes. We have a variety of men's Elvis jumpsuits to choose from for any price range. Whether you're heading to Las Vegas to hone your Elvis impersonation skills or you're just dressing up for Halloween, check out these Elvis Presley costumes today! We also have accessories like wigs and, of course, a pair of blue suede shoes.